'Tis the season for more rhubarb! And another terrific recipe from Beth Hensberger. 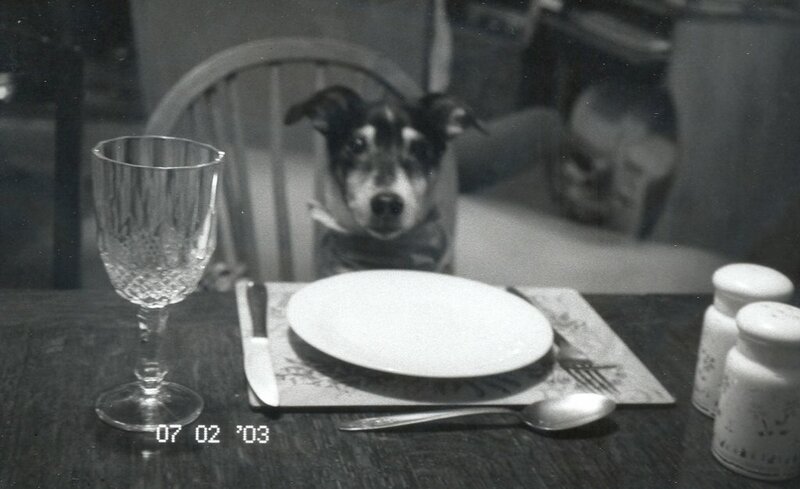 I had to take the book back, but have now added "Bread for Breakfast" to my Amazon.com wishlist. It is truly a terrific baking book! I can't emphasize enough how much I think each person should go out and buy it. This time rhubarb was only available in 1 pound bundles - this actually ended up lucky for me, because I could pick the freshest, sweetest stalks for the coffee cake. 1. Preheat the oven to 350 F. Line the bottom of a 10-inch springform pan with parchment paper, and grease the sides. 2. To make the crumb topping, combine the brown and white sugars, flour, cinnamon, and allspice in a small bowl or in the bowl of a food processor fitted with the metal blade. Cut in the butter with your fingers, or process just until the mixture forms coarse crumbs. Add the walnuts and set aside. 3. To make the coffee cake, in the workbowl of a heavy-duty electric mixer, cream the butter and sugars on low speed until light and fluffy, about 1 minute. Add the eggs and vanilla extract and beat until smooth. In another bowl, combine the flour, baking powder, baking soda, apple pie spice, and salt. Add to the creamed mixture alternately with the buttermilk. Beat on medium-high speed until the batter has a creamy consistency, about 1 minute. Stir in the rhubarb. 4. Using a rhubarb spatula, scrape the batter into the prepared pan. Sprinkle evenly with the crumb topping. Bake on the center rack for about 40-45 minutes or until a cake tester inserted into the center comes out clean. Remove from the oven and cool in the pan on a rack. To serve, remove the sides of the springform pan, and cut into wedges. Jenny's notes: My husband and I both really liked this. The texture was moist and light, the rhubarb was an obvious flavor and texture, and the crumb topping was superb (I did leave out the nuts again). I also chopped the rhubarb in a larger dice rather than "finely chopping" as the recipe suggested, since I wanted to really taste it. This did take quite a bit longer to cook than the recipe indicated, but I might blame that on my juicy rhubarb pieces. 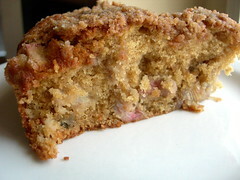 A note to the baker - rhubarb coffee cake will mold if it is not refrigerated. Darn! I love coffee cake - it is so moreish! But with the addition of the Rhubarb? Wow! Jenny, what a delicious looking cake - I've never had rhubarb but I'm sure this is delicious! This is a cake I would eat and eat and eat...Looks gorgeous! I've made rhubarb breakfast muffins before and they were lovely. Your cake looks really yummy, mmm. Ok, I had rhubarb as a kid, but where do you find it? I don't think I've ever actually noticed it in a normal grocery store. Am I looking it over? Wow, it's nice to have people commenting in my blog! Cassie - rhubarb is incredibly seasonal. I would look in the farmers markets and in the produce section - in my grocery store it was pre-cut and packaged where the fruit arrangements are. And I haven't found it in every store either. Frozen should work equally well for this recipe, if you're desperate! I've been scouring teh interweb looking for ways to use up the 2 or 3 pounds of rhubarb my MIL brought from her garden - this will help! !